Gillingham goalkeeper Stuart Nelson has signed a new two-year deal with the League One club. 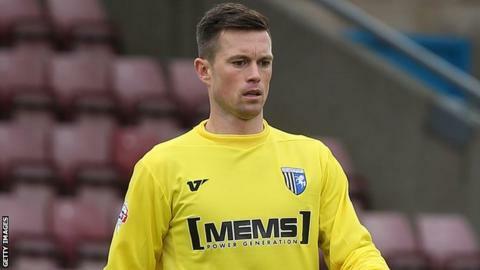 The 32-year-old shot-stopper, who joined the Gills from Notts County in summer 2012, will remain at Priestfield until the end of the 2015-16 campaign. Nelson was a crucial part of Gillingham's League Two title-winning side in 2012-13 and was an ever-present for the Kent club in 2013-14. He was voted the club's Player of the Year by fans earlier this week. Gillingham manager Peter Taylor, who has himself been given a new two-year contract by chairman Paul Scally, expects to announce his retained list shortly, with strikers Adebayo Akinfenwa and Danny Kedwell amongst those out of contract. "Once I knew I had the opportunity to have the job then straight away your attention goes to what we need and what we learnt from last year," Taylor told BBC Radio Kent. "I was always pushing the chairman that if it was to be me who was the next permanent manager then I wanted to know quickly. "We need to allow certain players to go and to make sure we don't lose out on players who could be available."